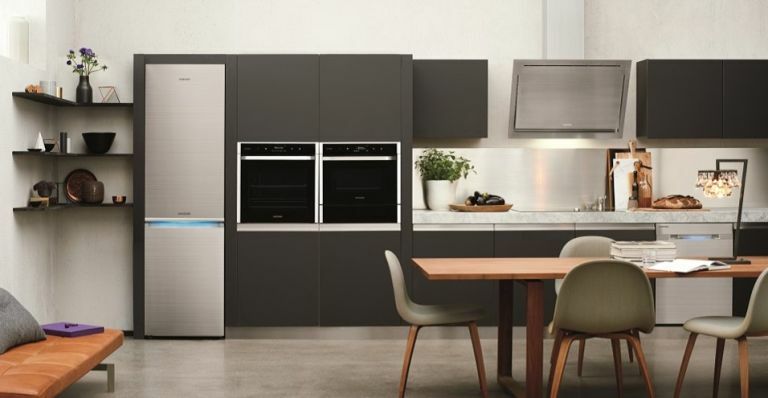 Samsung has just unveiled its new range of premium kitchen appliances and its been created in collaboration with some famous names from the culinary scene. The Samsung Chef Collection was designed in partnership with three world-renowned chefs, including none other than former Masterchef The Professionals judge, Michel Roux Junior. First there's the Samsung RB8000 Chef Collection Fridge Freezer (£1,299), which includes No Frost Technology to stop patches of ice forming around your chiller and a special Chef Zone designed to store raw meat and fish at optimum temperature. Then there's the Samsung NV9900J Chef Collection Wi-Fi Oven with Vapour (£1,199), which comes complete with 80 preset recipes, Wi-Fi connectivity (for remote functionality via your smartphone) and a unique Gourmet Vapour Technology for infusing your food with extra flavour. Finally, there's the Samsung NZ9000 Chef Collection Induction Hob with Virtual Flame Technology (£1,099), which uses Virtual Flame Technology to tell you how hot a hob is via LEDs, a movable Magnetic Knob for precision control and much more. Cat Footwear is once again teaming up with Gore-Tex to bring some of the most stylish yet rugged shoes we've ever seen - the Parched Gore-Tex Shoe. It basically combines the durability of a regular walking boot with the design and chic of a hi-top. The Gore-Tex collaboration was first introduced with the Autumn/Winter 2015 line, and now it gets an upgrade with the launch of Gore-Tex Surround, which will continue to make the product completely waterproof and completely breathable, offering a range that's perfect for rambles in hot and cold weather. The Parched Gore-Tex Shoe is priced from £140 at www.catfootwear.co.uk. If you're in the market for a new pair of running shoes, and you want a break the usual brands that dominate the scene, why not try out this impressive new offering from the clever minds at dhb? The main body of the Victory Running Shoe is a 'tri-laminted mesh', which dhb says brings both structure and support as well as enhancing the fit and feel. No one likes the distraction of hot feet either, so the fabrics choices around the heel and toes have been chosen specifically to optimise breathability. The gusset system not only helps with getting it on, it 'hugs' your foot making for a incredibly comfortable fit. It also reduces and slips, making every stride feel secure and confident. The dhb Victory Running Shoe is available now in blue (£60) and black (£52).